Truth by Kbaig: ATTACK ......... ON HAMID MIR ??? ATTACK ......... ON HAMID MIR ??? Why Hamid Mir nominated himself as ISI target ? Did he has some proof, if so . Why the evidence was not brought to court ? By declaring ISI as likely killer ( being a renowned figure ) has Hamid Mir not invited enemy agencies like RAW/MOSSAD to carryout this easy activity ( targeting Hamid Mir ) and bring huge criticism against ISI? Why Hamid Mir, Najam Sethi, Ayesha Saddiqa & Deep Saeeda have declared ISI as their likely killer but not going to prove it in courts ? Due to their which act they feel themselves so threatened by their National Intelligence agency ? 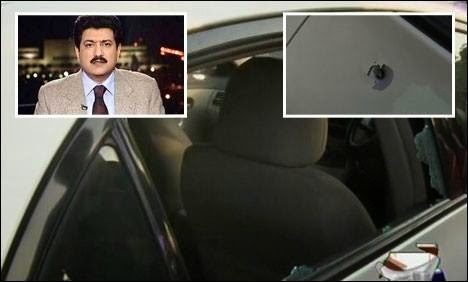 Why Hamid Mir was targeted today ? What imp. happened today in Pakistan ? The most important event of 19 April 2014, took place at Pakistan Military Academy (Passing Out Parade). The complete nation admired it overwhelmingly. To whome it pinched ? and who try to disain it ? If ISI wants to kill Hamid Mir, will they use this pity manner ? World's No-1 Intelligence agency has so poor planning that it is aware of the movements of Hamid Mir that after arriving Karachi he will pass through narrow streets but failed to target him because assassin's aim was so bad ? just TO CALL the propaganda against NATIONAL PRIDE ?